Park Place was a row of three houses, built on the south side of Park Street at the first bend east of the Pen Hill junction. Built on a bend in the road, the middle of the three houses was angled to follow the road contour. They were probably built in the 1840's and were demolished for the widening of Park Street in the 1960’s. The houses were identified within the 1891 census at which time one house was occupied by 76-year old widowed glover Charles Grimes with his daughter and her husband and child. The middle house was occupied by 64-year old widow Mary Ann Reade, a glover, and her five unmarried children and a grandchild. The third house was occupied by 48-year old glover George Hann, his wife and son. 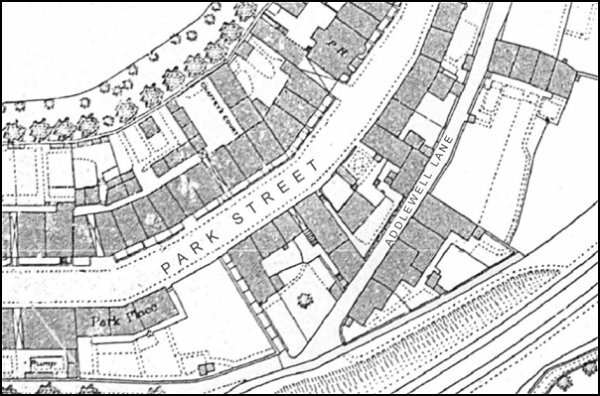 The 1886 Ordnance Survey showing Park Place at lower left, on the southern side of a bend in Park Street. The middle dwelling itself was built to accommodate the bend in the road.